Hey Guys, I just came across this little video and though it would be perfect for my site. These Dad’s know how to dominate parenting. Check it Out! No matter how busy dads are, they always make time for their family. Whether they are celebrities, who keep traveling the world for shooting movies, or pop stars on constant world tours, they make sure that they spend some quality time with their kids as much as possible. Here is the list of the celebrity dads we love for the love they shower on their kids. Brad Pitt has been one of the most kindhearted dads in Hollywood. Along with his wife, Angelina Jolie, he has adopted three children, Maddox, Pax and Zahara, who belong to different ethnicities and countries. They also have three kids together, Shiloh is their first born, and they have the twins, Knox and Vivienne. Not only has Brad been an amazing father to all the kids, but the couple has generated millions by selling the pictures of their newborn babies, which they promptly donated to different charities. The Wolverine may be a mean killing machine on the screen. But, in real life, he is like any other dad, with a heart full of love for his adopted kids – Oscar and Ava. In fact, his fans are often pleasantly surprised, when they see this highly accomplished actor locked in snowball fights with his adorable and loving daughters. Ben Affleck is one of the coolest dads you will find in Hollywood. He is very involved in his children’s life. You will find him everywhere from accompanying his kids at sporting events to playing in the park with them. In fact, he does everything that any normal dad does with their kids. From the looks of it, it doesn’t appear that his kids even know what a heartthrob their dad is. Clearly, their dad wants them to enjoy life, just like any regular kid their age would. We know him best as the cunning, reckless, ruthless, and pillaging pirate of the Caribbean. He has played everything from some of the darkest characters to the most heartwarming roles in movies. However, when he is around his children, Lily-Rose and John, the only role that matters to him is that of a father. He has largely kept them out of media’s eyes, and has shielded them from all the limelight. But, one thing that can be clearly said about him is that he will never have a dearth of costumes to entertain his kids, considering his wide repertoire of some really interesting costumed character roles. Will has always been one of the most down-to-earth celebrities in Hollywood. Anyone who has watched him on The Fresh Prince of Bel Air will surely find it hard to imagine him as a father. But, now he is a father to three kids and a very responsible one at that. He has always had a great relationship with his kids. In the video, Just the Two of Us, Will can be seen goofing around with his eldest son, Trey. Also, his support for his son, Jaden’s career is widely known. Although we are certainly distressed with Jaden’s words of wisdom from time to time, his father won’t be giving up on his son anytime soon. That we respect. A father’s love is something that can’t be simply expressed in words. Perhaps, these images tell a better story of how much a dad can love his child. Compiled from all over the world, these stories of dads are truly remarkable, and go on to show how much of a giving soul it takes to be a dad. Here is a Chinese father, whose son is disabled. But, the family does not earn enough to provide better transportation means to the kid. That doesn’t mean that this courageous father was going to let his son suffer for life. He carried him to school daily on his back to ensure that he gets the education he deserves. The fact that he had to walk 18 miles combined to and from the school did not stop him from fulfilling his task every day. Hats off to his love. This stepfather has once and for all settled the fact that blood is not everything. He has a 6 year old stepson, who is wheelchair bound. This usually means missing all the fun that friends his age would be having at celebrations. Not in this case. His stepfather turned his wheelchair into a tank for the Halloween. This is the raddest thing we have seen a step-father get into. Kudos to all the loving step-fathers. If you put yourself completely into something, then nothing is impossible. This dad exemplifies this statement in the most heartwarming way. When his son was born disabled, he could have simply accepted it as fate. Instead, he chose to defy fate. He then did the unthinkable. He took his disabled son to marathons. This father-son duo has participated in numerous athletic events, and the father is seen pushing his son’s wheelchair along the course. This is how they spend quality time together, defying the nature. Different fathers have different ways of celebrating their parenthood. Dale Price decided to do it in his own unique way. He dropped his son almost every day of his school. And each time he did, he bid goodbye to his son in a different costume. Over the course of an entire year, this superhero dad dropped his son as everything from the Terminator to Merida from the movie Brave. He had donned about 170 costumes over the course of the year. Here is a man who has tattooed on his body every drawing that his son has made since he was 5. He is a walking, talking memory bank of his son’s childhood. The drawings are like what any kid’s scribbling looks like. There is no limit to how far dads can go for their kids. There are cool dads. Then, there are these. These dads can only be termed as exceptional. Dads can be tough on us sometimes, and we usually see them as the disciplinary force of the family. But, they too have a heart. These dads just prove that they have a heart full of love, understanding, and unconditional support for their children. Most of the dads will be at their wit’s end if they come to know that their son wants to dress up as a girl. We might even chide him or force him to dress up “properly”. But not this dad. He wants his son to grow up to be a confident, self-assured and compassionate man. One that can own his own lawn care business if he wants to. That means, that his son should not harbor any fears or inadequacies about himself. 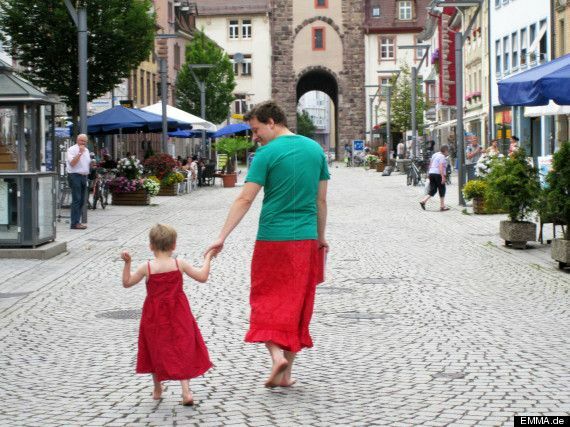 Therefore, when he was going through a phase where he liked to dress up in skirts, his dad joined him in solidarity and wore one too. Bryan Martin gave his daughter Breanna a copy of Dr. Seuss’s “Oh, The Places You’ll Go!” as her graduation present. She though it was just a book she loved. But, it was so much more than that. For the past 13 years, ever since she was in kindergarten, he got her every teacher, coach, and other mentors to write something special for her in this book. Needless to say, it left her tearful to read all that her mentors had to say about her. This kid suffers from Spina bifida, which binds him to a wheelchair. But, his dad wasn’t going to let any stupid birth defect hamper his son’s fun at the Halloween. 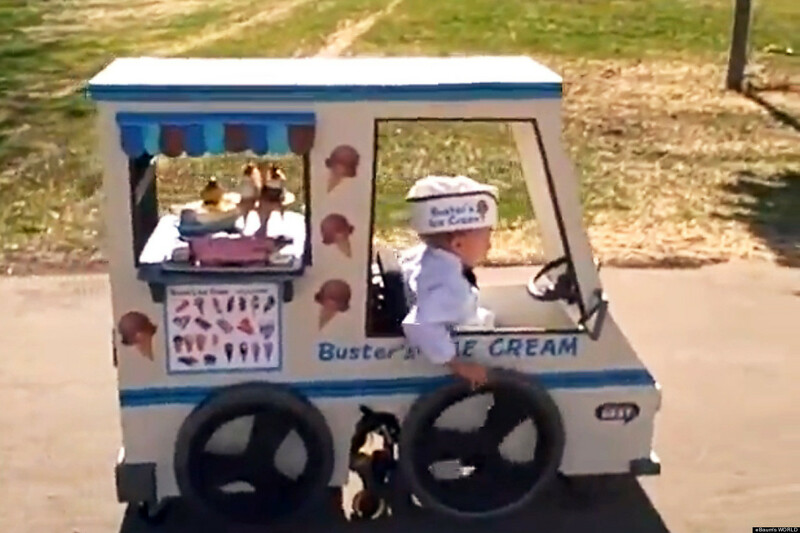 Therefore, he custom-built an ice cream truck for his kid, and turned the wheelchair into an amazing vehicle that every child around the world loves. Daniel Sherrouse possibly set a new bar for dads out there. 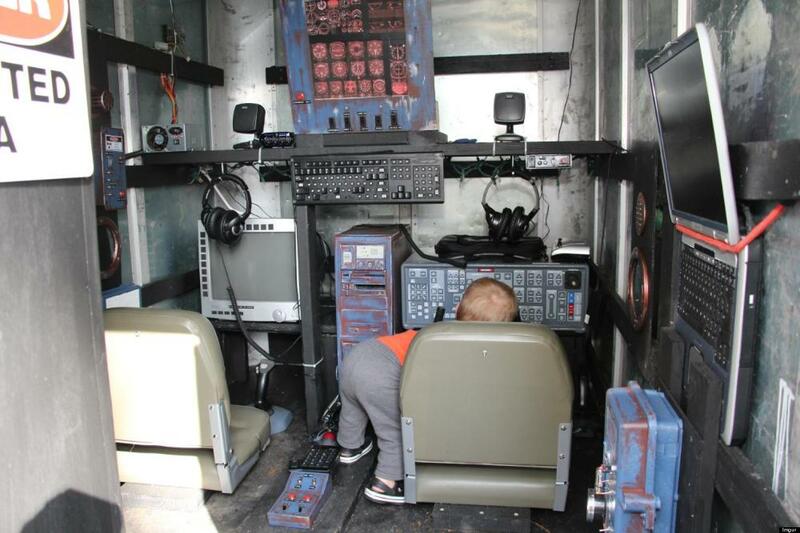 When he came to know that his wife was pregnant, he spent the next ten months outfitting a trailer with everything from dashboards and equipment, to controls, and what not, to transform it into a spaceship cockpit. Of course, most of the equipment is just for show. But, his kid can play Pioneer Space Simulator on one of the screens. Daniel has plans to equip the simulator with more equipment in the future to stoke interest for science in his son. Mothers and Fathers have a completely different way of parenting. While mothers tend to me more careful and cautious about their children, fathers add the spice of adventure and excitement into life. Although the baby in this picture is too small to understand this, she has one hell of a dad. Humor like this is what makes the highly exhausting job of parenting a better experience, both for the kids and the father. This baby will grow up to be one happy child. Parenting is the toughest job in the world. While it is an exhilarating experience to welcome a new life that is the splitting image of ourselves, it does not prepare us for all the responsibilities that it entails. Sure, if parenting came with an instruction manual, a lot of us would have been much happier. But, in the real world, no book can match the instincts, and unconditional love that parents bestow on their children. There is a lot you will learn during your journey through the parenthood. But, for now, these tips should get you started on how to become the coolest dad ever for your little angel. Be yourself’ is a pretty common parenting advice you might have got from others, which you promptly threw out the window. Well, there is more to that than you thought. Most dads have a great sense of humor. We think of ourselves as standup comedians, and chances are that your partner fell in love with your sense of humor too. So, now you finally have a completely fresh audience that only you can entertain. 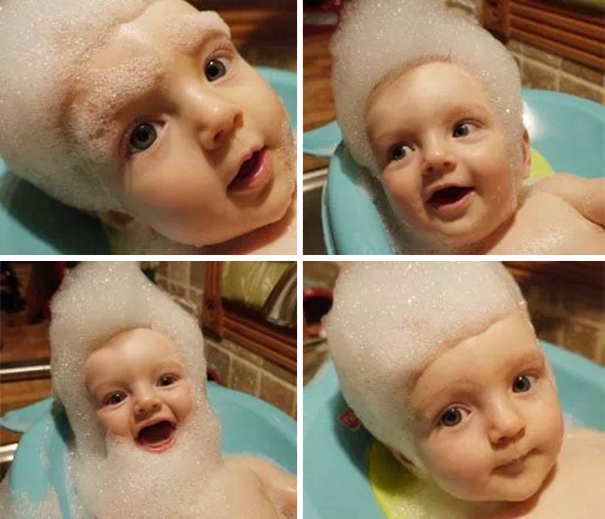 Dress up the little baby in creative ways, click funny pictures, and do whatever you think is funny. After all, what else do those little buggers do all day anyway? Just be careful with them, that’s all. The surest way to become the “Best Dad Ever” is by doing everything you can. By everything, we mean everything. You and your spouse share each responsibility equally. There shouldn’t be anything that only you, or the child’s mother should do. You should change the diapers, cook food for the family, and let your child polish your nails if they want to. Only when they see how you and your wife share everything, do they develop a lasting respect for you. In addition to making memories for a lifetime with your baby, also learn to capture them forever. When your children grow up, they will love the effort and time you spent on capturing their childhood. Every time they look at pictures of their younger selves, and smile at them, they will feel warm, remembering you and the days spent with you. Whether they wish to wear a princess costume for a party, have a tea party with you, apply makeup on you, or dress you up for Halloween, you have no say in the matter. You may be a man. But, when your little angel wants you to be Cinderella, you dress up as Cinderella. This will show them that their father is a confident man, who isn’t afraid of any gender roles. It will also develop a strong character within them. In the beginning, it could be as simple as playing with their favorite stuffed toys. As they grow, their priorities change, and new things begin to capture their attention. It can be Facebook, cheerleading, sports, or something else. Do not force yourself into their life. Just try to encourage them in whatever they are doing, and keep helping them find the right and better ways of doing things. Sometimes, letting them fall may be just the thing they need as a wake-up call. Fathers love us unconditionally. They will happily give the whole world away just for our happiness. Although they may not always be very expressive, they always love us unconditionally. We are the apple of their eyes, the little angels, whom they will protect against every evil in the world. It is not always easy to see what makes your father the most awesome man you will ever meet. But, the following signs should be enough to let you know how lucky you are to have that man in your life. No kidding. You may have a best friend in school, college, or even on that summer camp. But, time and distance tend to push you apart and force you to find new friends in life. Amidst all that change that your life undergoes, your father will always be the one constant best friend in your life. He was your best friend when you were in kindergarten. He was your best friend when you needed some advice in your teenage years. He will be your best friend later in your life, when you want wisdom beyond your years. Your very concept of ‘true love’ comes from your father. You have seen him respect, value, and adore your mother like a queen. Well, it wouldn’t be wrong to say that your father has ruined you for good. You can never settle for anything less than what your father had and showed for your mother. That’s great because you deserve true love too. Your Father protects his family with a passion unlike anything you have ever seen. Everything he does puts his family’s interest at the fore, even before his own needs. He may be hard on you and your siblings, when it is time to discipline you. But, he always understands and accepts your flaws, mistakes, and limitations. Moreover, you always know you can find the best solutions to all your problems when you go to him. His unselfish spirit has left an indelible mark on you, and you aim to be as awesome a parent as him, one day. He is always so proud of you that he is telling everyone he knows about you all the time. Whether it is a party or a family reunion, chances are that the loudest man present is your father. His hearty and exhilarating laughs never fail to bring a smile on your face. Well, let’s face it. Dad jokes are not always the best. But, you simply can’t help but join in the fun. He truly has an irresistible charm about himself. Your life can go through the roughest phases. You might even feel completely lost at times. People may leave you. But, your father is always there like a rock support for you. Whether it is to fix your bike’s flat tire, to watch you at your sporting events, or whenever there is something important going on with your life, whether it is good or bad, you can always count on him to be there. Just to make you feel warm. This blog post is sponsored by Milton Lawn Care. by Michael Reed	| Posted on April 13, 2016 | Comments Off on Coming Soon! Hey everyone, I appreciate you checking out my site. Still working on setting this thing up. In the meantime, check out these Rad Dads!! Powered by the Zues Theme.Copyright © 2019 Nevada Rad Dad · All Rights Reserved.